Mornings are so rushed, I have no time to actually make breakfast. Usually, I scramble something quickly together as I’m putting on my last shoe and running out the door. What I’ve found, when I’m up to it, is setting something aside to grab and go works for my morning routine. To be honest, I’d rather be running behind with a breakfast packed than skip it all together. This quick and easy oatmeal will make mornings just a little brighter. 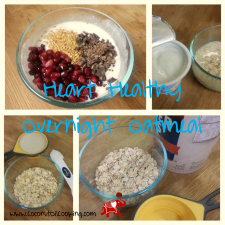 I love oatmeal because it is really good for for your heart and cholesterol. In an effort to make this even better for my ticker, I added in two ingredients: pomegranates and dark chocolate. Pomegranates may help improve blood flow to the heart and may help prevent plaque from building up around blood vessels. Dark chocolate, I mean real dark chocolate, has been found to lower blood pressure, lower LDL and increasing antioxidants, according to WebMD. 1. Mix oats, warmed (important) almond milk, and coconut oil until thoroughly blended. 2. Add remaining ingredients and stir until blended. 3. Put in air-tight container and pop in refrigerator overnight. 4. In the morning, remove from fridge, stir again, microwave if desired and enjoy. I love pomegranates, like a lot. But this would also be delicious with strawberries, blueberries or raspberries. Aside from your vegetables, you’re hitting a lot of the main food groups to help you feel fuller longer. For other great starts to your day, try our Perfect Paleo Breakfast and Protein Breakfast Cookie.